Holistic Circus Therapy or HCT, delivers evidence based therapeutic and educational practices via circus activities to increase capacities and promote independance in client's abilities to meet their self care, leisure, and productivity goals. communities. HCT activities are designed to reflect the functional abilities, interests and goals of its participants. Tasks are incrementally graded (adjusted) in order to be challenging yet achievable. This model represents a dynamic relationship between environment, person, and occupation. Change in any aspect affects all others. Spirituality resides in persons is shaped by the environment and gives meaning to to occupations. The Accesible Circus Paradigm uses circus as an empowerment and educational tool for individuals and communities. Activities are client-centered to reflect the interests, goals, and functional abilities of participants. Tasks are continually graded to be challenging yet achievable, therefore increasing self-motivation to participate and engage in the therapeutic process. Intervention focuses on increasing capacities which enable participants to thrive and experience success in achieving their self-care, leisure and productivity goals. Circus, as a discipline, provides a variety of experiences and activities which facilitates positive emotional, physical, and mental health outcomes. Occupational therapy and circus promote a better quality of life using the experience of play, fun and creative expression. all the life skills that so many young people may not be able to develop in school or at home. 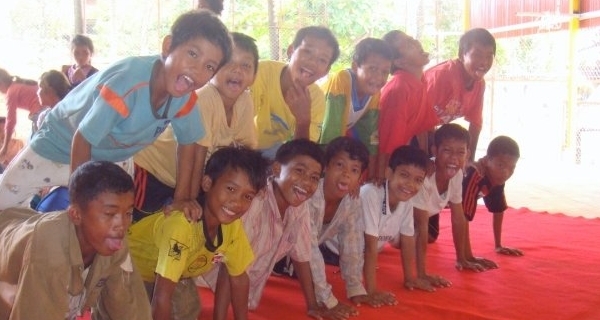 programs in Cambodia, one for atrisk youth and another for people with disabilities. The results and benefits experienced by multiple populations compelled Jill to create HCT in 2010 upon returning to New York. WHO ARE HCT PROGRAMS FOR? HCT programs are administered in 3 different categories: services, professional development training and research initiatives. 2. Professional Development — HCT is proud to offer trainings in its pioneering method to other professionals in the occupational therapy community. 3. Research Initiatives — HCT partners with universities and organizations dedicated to excellence in research, in order to continually test its unique approach along other evidence based practcies accepted and used within the profession.